We have recently witnessed an explosion in the number of neurons that can be recorded and/or stimulated simultaneously during neurophysiological experiments. Experiments have progressed from recording or stimulation with a single electrode to Micro-Electrode Array (MEA) such as the Utah Array. These MEAs can be instrumented with current drivers, neural amplifiers, digitizers and wireless communications links. The broad interest in these MEAs suggests that there is a need for large scale neural recording and stimulation. The ultimate goal is to coordinate the recordings and stimulation of potentially millions of neurons from many brain areas. Unfortunately, current state-of-the-art MEAs are limited by their physical size and rigid configuration. To make large scale, fully specifiable, electrical stimulation and recording possible, there are a number of problems that need to be solved. For example, the electrode should be disconnected from the base, so that they can be arbitrarily placed, using a syringe, freely in the nervous system. This means they must be small, powered wirelessly and must be individually selectable to actuate individualized stimulation/recording. To overcome these challenges, we propose the “microbead”, an ultra-small neural stimulation, that is currently implemented in a 130nm CMOS technology with the following characteristics: 200 μm × 200 μm × 40 μm size; all micro-electronics on single chip; integrated electrodes and coil and optimized wireless powering. The stimulating microbead is tested in a sciatic nerve to generate leg movements. On-going work on a recording microbead is also investigated with following characteristics: wireless powering using steerable phased coil array, greater than 20x neural data compression and backscattering telemetry. These microbeads could eventually replace the rigid arrays that are currently the state-of-the-art in electrophysiology set-ups. 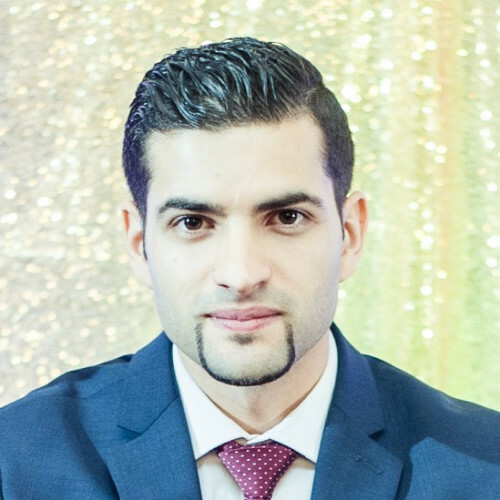 Adam Khalifa (S’12) received the B.S. and M.Phil. degrees in electronic and computer engineering from the Hong Kong University of Science and Technology, Hong Kong, China, in 2011 and 2013, respectively. He is currently working toward the Ph.D. degree with Johns Hopkins University. His research interests include low power mixed-signal CMOS circuit design for neural interfaces, wireless power transfer systems, microfabricated electrodes, and packaging of implantable systems.